Frequency 49, a San Francisco Bay Area-based wind and piano chamber ensemble, is dedicated to broadening awareness of compelling woodwind repertoire through performances of highest artistry. By using flexible instrumentation, the group explores the spectrum of sound colors that are created by this combination of instruments. 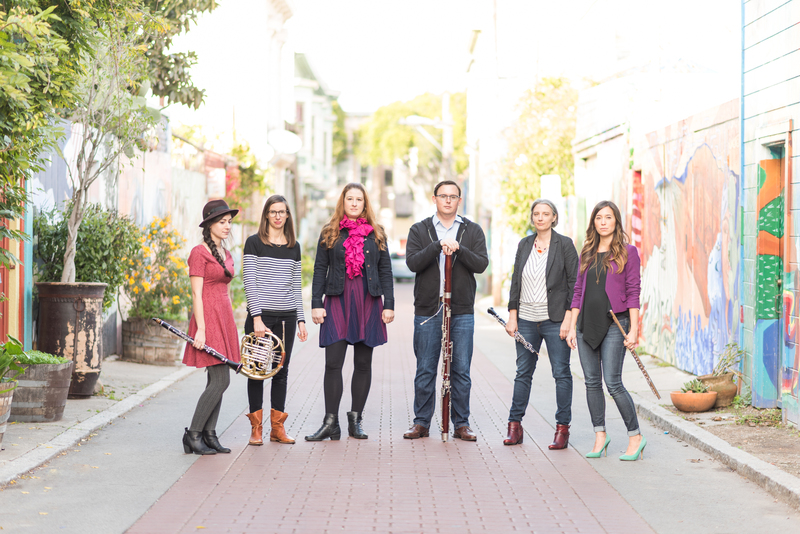 Formed in 2012, Frequency 49 has appeared in recital throughout the Bay Area, including the Arlington Community Church Concert Series, Berkeley Chamber Performances, Hot Air Music Festival, Manteca Kindred Arts Series, Music at Old St. Hilary’s, Old First Concert Series, San Francisco Conservatory of Music, and Trinity Chamber Music Series. Highly sought after by composers, they have premiered music by up-and-coming American composer Robert Pierzak, contemporary composer Sy Brandon, hip-hop/classical fusion artist Joowan Kim, and jazz musician and music educator David Hart. They have also collaborated with world-renowned pianist Mack McCray. Committed to education, they have also given masterclasses and performances presented by the Chamber Music of Northern California. Current members of the ensemble are Katrina Walter (flute), Adrienne Malley (oboe), Jeannie Psomas (clarinet), Patrick Johnson-Whitty (bassoon), Audra Loveland (french horn), and Margaret Halbig (piano). Members hold advanced degrees from prestigious institutions including Carnegie Mellon University, the Eastman School of Music, Northwestern University, the San Francisco Conservatory of Music, the University of Michigan, the University of Cincinnati Conservatory of Music, and the University of California, Santa Barbara. Individual members also perform with orchestras throughout the Bay Area, including the San Francisco Symphony, San Francisco Ballet, Symphony Silicon Valley, and the California, Marin, Monterey, Oakland, Santa Cruz, and Santa Rosa Symphonies.